So. I moved in with a boy this weekend. As it turns out, boys take up space. And they come with stuff. Lots of stuff. Stuff that you don’t necessarily want on your walls (cough Chris Christie posters cough). Stuff that you don’t believe they will ever open again (cough law school textbook on wills, trusts, and estates cough). Stuff that you don’t necessarily believe they need (cough Nintendo 64 cough). But…you own two stand mixers (that’s my persimmon one up top! ), over a hundred cookbooks, and twenty different colors of cupcake liners (among other things). And though I think we can all agree that actually you do need, use, and want all of these totally critical items…you’re really not in a position to argue. So instead of fighting over whether the Nintendo 64 needs to exit the apartment immediately via a Fed-Ex truck to someone’s parents’ house…you find a nice spot for it on a very high shelf. Because maybe you’re still getting used to the idea of this being “our” space, but that doesn’t mean you can’t still celebrate the fact that, whether you can really believe it or not. 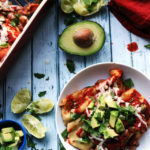 And what better way to party it up in your new place than with an avocado-rich meal, a couple of margaritas, and a little bit of pregaming for Cinco de Mayo? …hmmmm, nope, I’ve got nothing. Okay, so I realize this is technically just a salad but the reality is that when you add avocado and toasted cubes of jalapeno cornbread to a dish, some sort of magic happens that turns it into something so much more. It’s a salad, yes, but it’s also happy, bursting with flavor, totally crave-worthy kinda food. And it kinda makes you want to salsa in your living room and forget that you were fighting about video game consoles. So…that’s something. Speaking of avocados and Cinco De Mayo recipes, have you heard about the new Avocado app? We’ve been using it to inject some cuteness into our relationship even amidst all the moving stress and it really is a great way to stay connected, share photos and send private messages with your loved ones any time, any where. 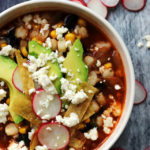 Also, if you love avocados as much as I do, then you should definitely check out the I Love Avocados For Cinco De Mayo sweepstakes from Avocados From Mexico and Avocado. All you need to do for a chance to win the first place prize (though there are also second and third place prizes!) of $1000 and a premium version of the Avocado app is to post a photo of you and your special someone celebrating Cinco de Mayo with an Avocados From Mexico-infused dish (or just a photo of your favorite avocado dish). Enter by going to the sweepstakes tab after clicking on the Avocados on Facebook link at the bottom of this post! And, in case you still haven’t gotten enough of avocados after all of this (and really, is there ever such a thing as “ENOUGH” avocado? ), then you should head on over to the #iloveavocados for Cinco de Mayo Twitter party on May 7th between 3 and 4 pm (EST) hosted by @Avocado and @guacgrl. Now, if you’ll excuse me, I have some more of my boyfriend’s superfluous possessions to hide. I mean, er. Things to unpack. Right. Preheat the oven to 375. Grease a 9-inch loaf pan (or just line with parchment). In a large bowl, whisk together the milk, oil, and eggs. In a second bowl, whisk together the cornmeal, flour, sugar, baking powder, baking soda and salt. Stir the dry ingredients into the wet ingredients, mixing until just incorporated. Fold in the jalapenos. Pour into the prepared pan. Bake for 30-40 minutes or until a toothpick inserted in the center comes out clean. Let cool completely. Preheat oven to 425. Spread the cornbread cubes on a parchment lined baking sheet and toast in the oven for 6-7 minutes. Toss and cook for another 6 minutes. Remove from oven and let cool slightly. 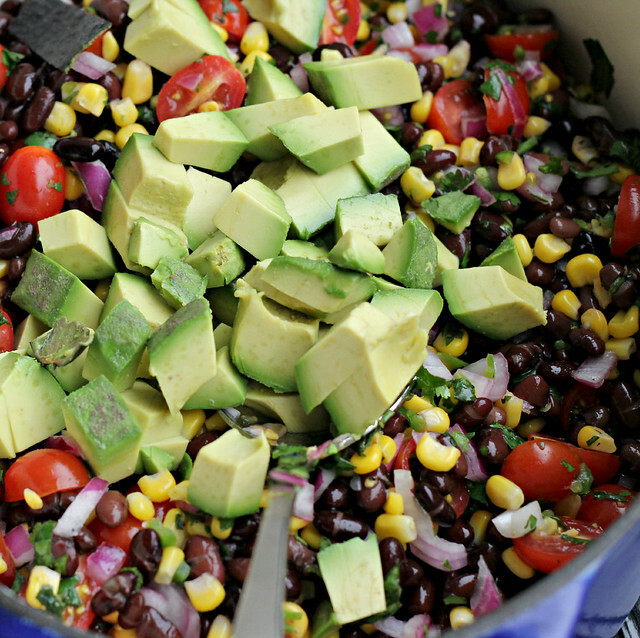 In a large bowl, toss together the spinach, black beans, corn, jalapenos, red onion, cilantro, half of the lime juice, salt and pepper. Let sit for 10 minutes. Toss in the avocado and grape tomatoes. Season to taste with salt and pepper. 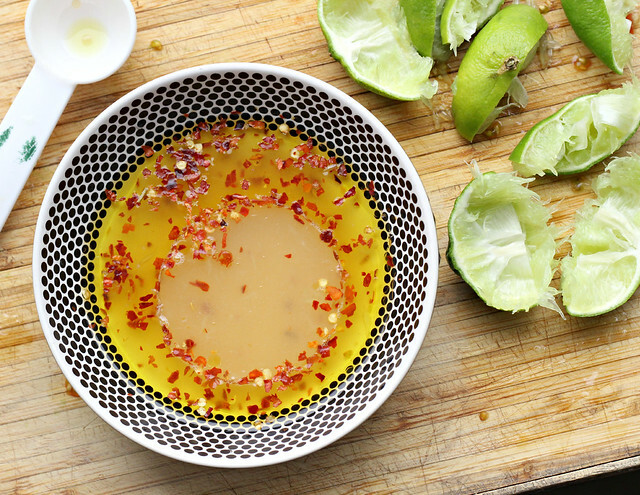 In a small bowl, whisk together the olive oil, rice vinegar, red pepper flakes, honey, remaining lime juice and salt and pepper to taste. Add to the salad and toss to combine. Stir in the cornbread cubes and serve. Congrats on the co-habitation!! 🙂 Boys do come with a lot of stuff! Lovely looking salad you’ve made here, too. Avocados are the best. Your new shelving looks great! Can’t wait to see more of the new place. Love that this is a salad that doesn’t really feel like a salad. That panzanella looks so good! oh that picture of the two of you is adorable!!! This looks perfect for cinco de mayo! Congratulations on a successful move. I love the photo of the two of you – such a cute couple! That panzanella looks seriously delicious. Too funny about the “stuff”! We all have our extra things, don’t we?! Cute pic of you two and delicious recipe, as always! What a wonderful time–moving in together! I hope he lets go of his stuff. Mine won’t let go of German textbooks. From highschool. We’re almost 30! Give.it.up! Oh gosh, the video games. Don’t even get me started, we have more systems than I’d care to admit 🙂 Shane has a “man cave” in the basement, which has been the perfect solution for us! I love the cornbread in this panzanella, I could eat my weight in cornbread – it’s the best. Moving is so exciting!!! I have to disagree about N64…totally essential in the living room 😉 😉 But I do agree about the love for avocados. In fact, I’m obsessed. 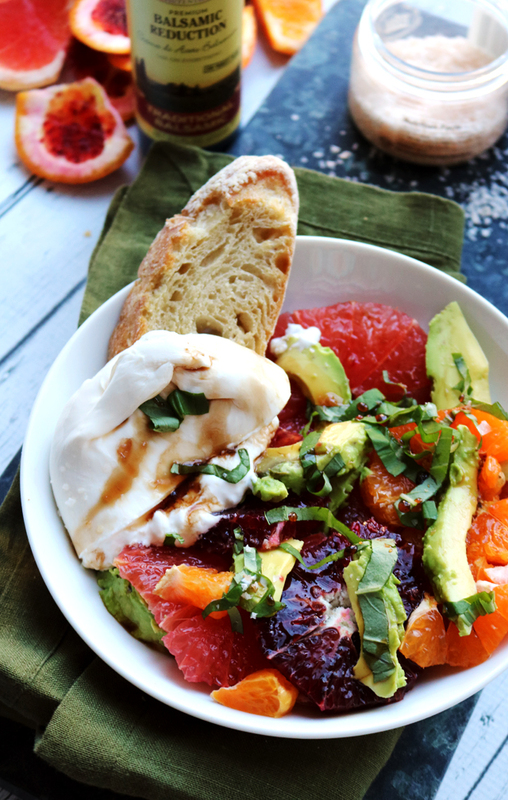 This Mexican dish looks refreshing and filling all at the same time — yummm! now THIS is a panzanella i can enjoy! i don’t usually go for that sort of thing, but i can never resist black beans, corn, and avocados. We have Nintendo, Wii, and XBox! How many video game consoles does one grown man need? (So sayeth the gal or has an unhealthy addiction to kitchen tools. Why yes, I do need another apple peeler!) Love avocados and love that you two are sharing living quarters now!! Whoa…this is my kind of salad! You definitely need all those cookbooks, mixers, and cupcake liners 🙂 Congrats on the move! Now, I’m not a fan of video games after my last BF who played Call of Duty way too much, but nintendo 64 is awesome! The only word I can come up with is YUM! My mouth is seriously watering and it’s only 9:45. This will be making it’s way to my menu very soon. Ohhh you and the Boy are so cute!!!! 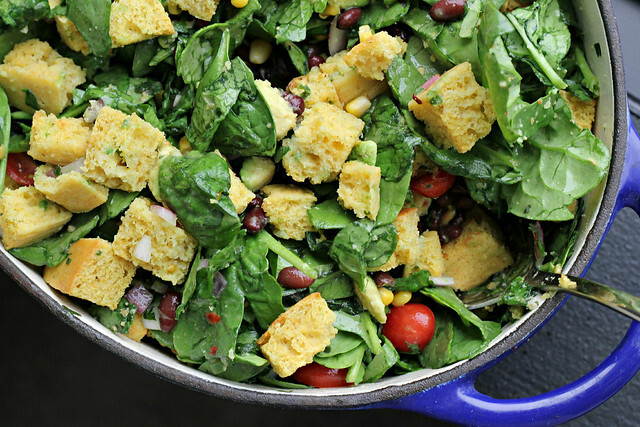 Now I have to tell you your Cornbread and Black Bean Panzanella looks amazing! Making this for din din tonight!!!! You guys r so cute ;). When I first started dating my hubby his house was adorned w a wagon wheel coffee table, Shania Twain posters & a huge entertainment center. Oh, & NO vacuum w 2 dogs! This is soooo what I’m making for Cinco! You two are ridiculously cute together. haha! This post gave me a good laugh! 100 cookbooks is serious! I hope there’s room for everyone and their valuable possessions! 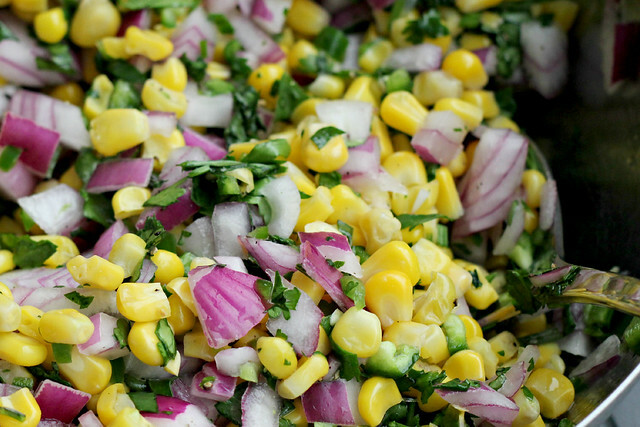 Great dish, btw…I love the corn, beans, etc. Looks great. what a great idea – avocados. I must get some before the week is out. I love the pic of you two – we finally see The.Boy. You two are so cute. I wish you both all happiness in the known universe and a little extra! Wow this looks great. I heart avocado anything and that pix of you and The Boy is adorbs. I’m sure your new place looks like a crazy-house now, but once everything finds its place (and compromises are reached 😉 ), you’ll feel right at home. 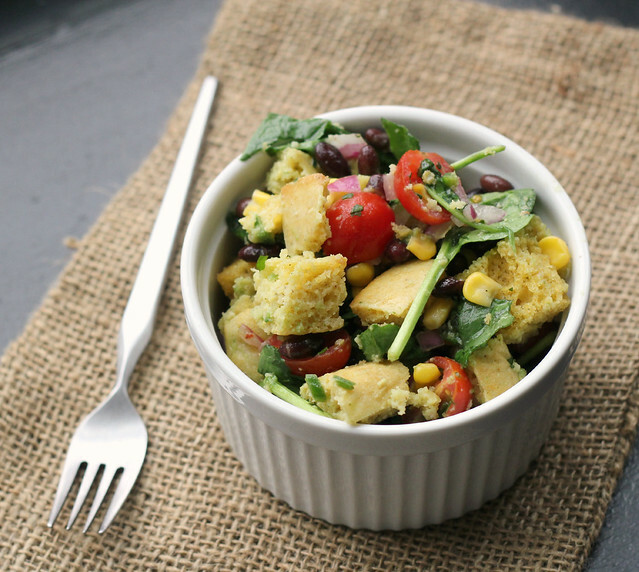 This spicy cornbread with avocado dish looks sooo good – I love avocado! I love this take on panzanella! Congrats on your sharing of stuff! What a cute pic of you & The.Boy. I am glad you have settled in. The panzanella looks perfect!! Seriously looks SO good! I can’t wait to hear about your adventures living with the boy now!! Congrats on the move! This sounds way better than the takeout pizza we scarfed down after we moved into our house. Love that you threw in some margaritas too. My husband wanted to hang dorm room looking posters on the wall when we were first together, too. What’s that about??? Haha! Awww, congratulations Joanne. You guys will learn so much about each other and enjoy figuring out your new routine. Always easier to agree on things over a scrumptious meal of panzanella, though. 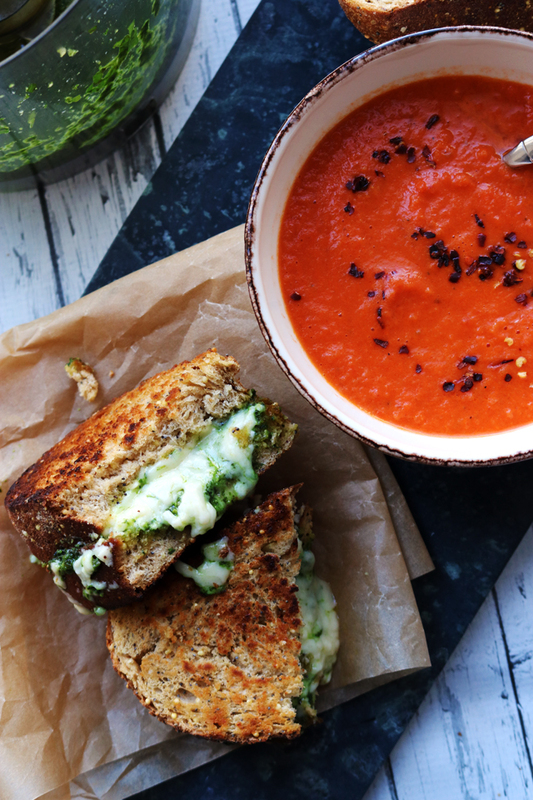 This looks outrageously good! That picture of you guys is too cute! And this panzanella – YES! I could dive headfirst into this, starting with that cornbread. Nice color on the mixer Joanne! 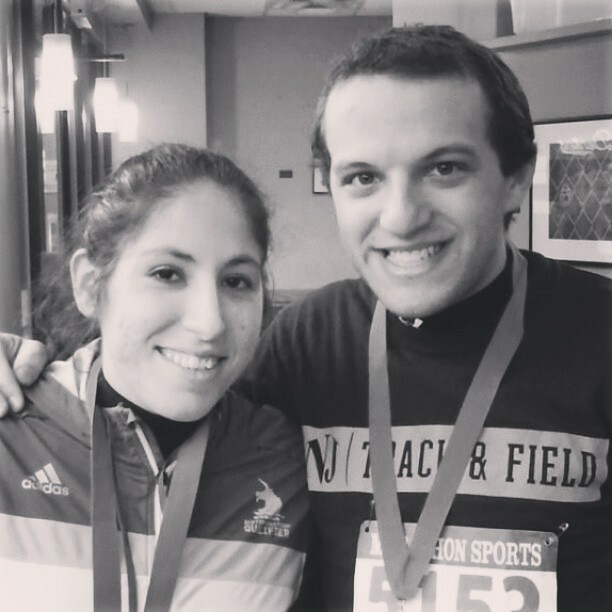 Congrats again on the new apartment and chapter – so happy for you guys! Oh my God. This is happiness personified… I love everything about it! I may need to make this immediately. Err… first thing after this silly juice cleanse! Oh you are right, this is much more than a salad, and it looks like heaven! 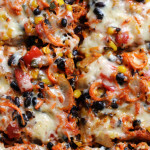 Of course I love me some avocado, but you’ve got my other favorites, cornbread and black beans, too! Wow! I am so jealous of your cookbook collection!! This looks like the perfect thing after a big move! Have I told you that you are a goddess lately Joanne? IF not, I really should tell you more often. This looks CRAZY DELICIOUS! 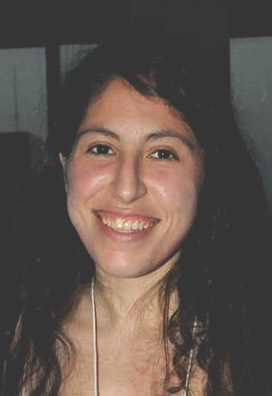 Kudos to you for being such a cool girl and putting up with the N64 on the top shelf. The pic of you two is too cute. So glad you shared that. Thanks for the mail btw regarding my wasabi mashed potatoes. You are a Goddess….trying to make up for lost time. Ah, the oh-so-exciting “mixing of the stuff”. I didn’t think the beau needed all of that computer stuff, but I suppose I didn’t need two bookshelves of heavy books either. Oh well. That salad looks amazing, I would probably eat all of the cornbread before the salad was ready, though. CONGRATS!!! And this looks awesome! I don’t make panzanella nearly often enough. So…I LOVE panzanella, I LOVE avocados, I LOVE cornbread, and I LOVE everything else in this recipe. This is amazing. I’ll most definitely be making it. Your pictures are also amazing (as always). PS: doesn’t every boy need a Nintendo 64?! Lol, and, as a post-law student (almost grad!) myself, I can see why he wants to hold on to that text book. ? Yay, to moving in together! You’re bound to have a happy life if this deliciously colourful panzanella is anything to go by. G’day! Your photo drew me right in, TRUE! Congrats! Great photo of you…the smiles say it all too! We did Mexican tonight – WITH avocados. I have a lot of meals this week that will be making use of the green…fruit? Congrats on the new moves (literally)! =) What a great way to celebrate…natures butter + carbs ohhh yes!! 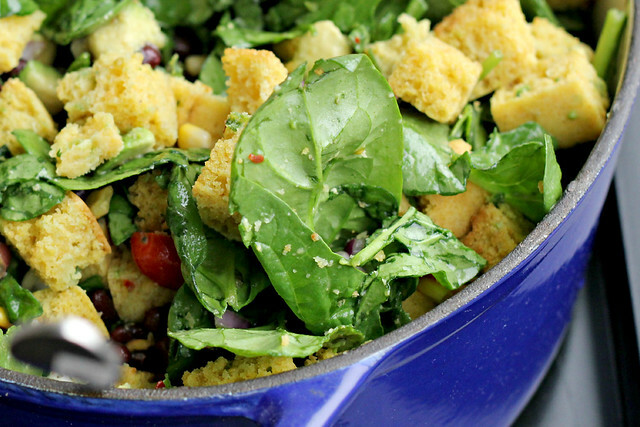 I’ve never thought to use cornbread in a panzanella but I love this, and especially that you made your own cornbread! Good luck with the rest of the unpacking! Dave has so many clothes that I’ve got a suitcase for the ones he cannot throw out but does not wear! What a beautiful festive salad! Love the idea of cornbread in a Panzanella. Great post! After our first cornbread panzanella a few years ago, it’s now official that they make excellent croutons for salads. With the avocado, it’s a great summer dish! You both look absolutely adorable in the picture! The food – man that looks good too!!!!! My husband came to me with about 800 CDs, since then his collection has doubled. But he is worth it 🙂 This dish looks delicious, I am a huge avocado fan. Good luck with the hiding,….er…unpacking 🙂 I remember, back way back in the day, my boyfriend, husband to be came equipped with LPs, lots – early Bob Dylan, Woody Guthrie, jazz, and etc. I found it all rather fascinating. But aside from that, avocados rule. We’ll come up with something for Cinco de Mayo, and thanks for reminding me. 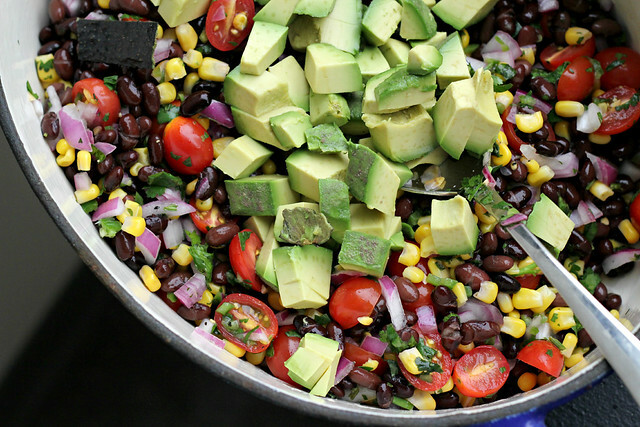 Mmmm, avocados, corn, black beans, PANZANELLA! Sounds good to me! Love the photo of boy and you! Now I can finally put a name to a face when I read about your lives together! ENJOY!!! Congratulations again!! I’m glad everything ‘essential’, in the loosely defined meaning of that word, has found a home 🙂 That photo of you both is great too. Congrats on the cohabitation hun! BF and I moved in together a few months ago. He came with just his clothes- yay! lol. 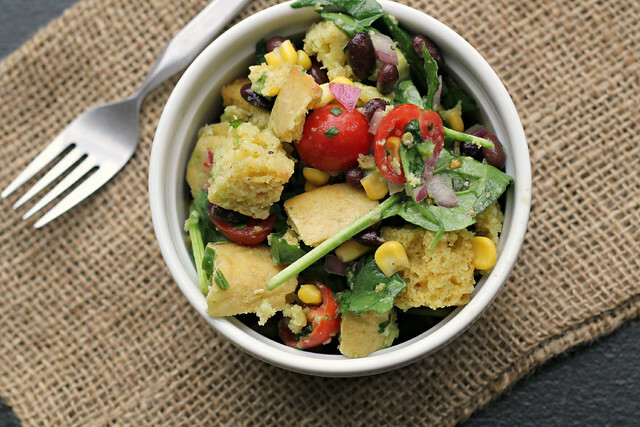 Love this salad with the cornbread in it! Aww – cuteness! 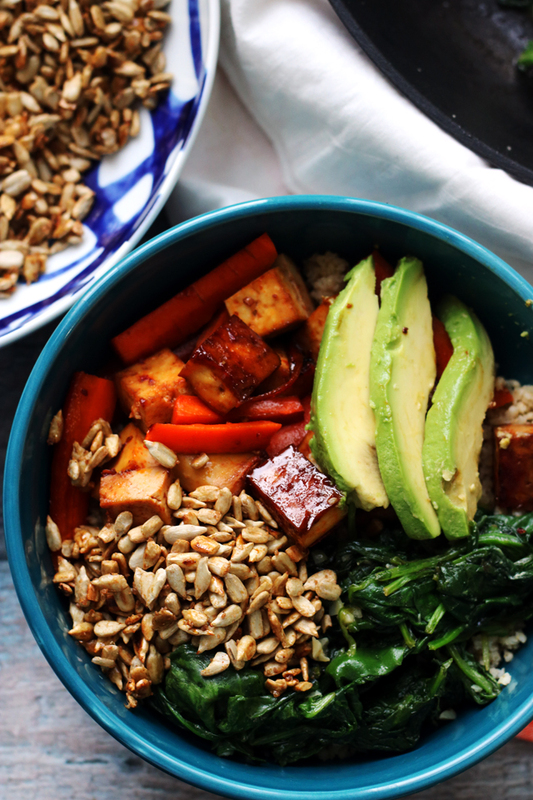 You don’t have to convince me on the absolute deliciousness of this salad! LOVE. Congrats on the move! I’m impressed you’ve been able to keep up with the blog so much while moving…we moved a week ago and I had forgotten how much time packing and unpacking takes! 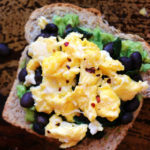 My daughter is becoming obsessed with avocados, which I don’t really love, so I am on the lookout for recipes that seem easy for a 7 yr old to put together. This looks perfect! Pinning now! 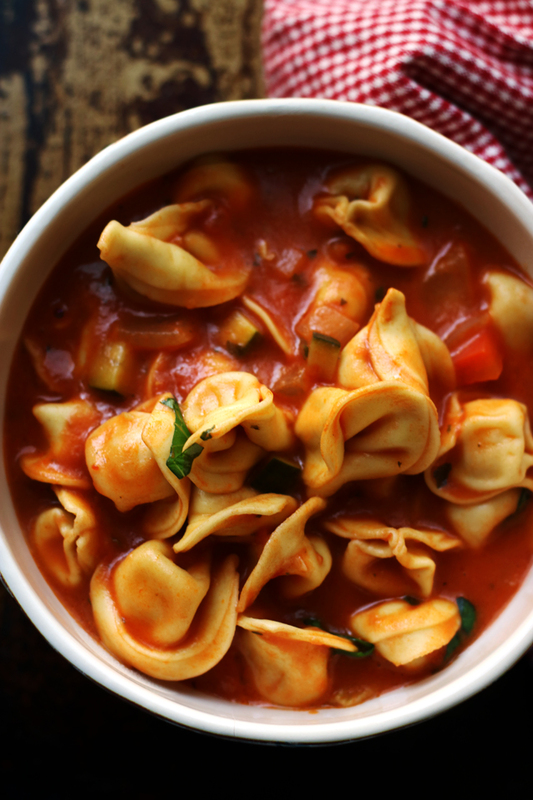 Joanne, I’ve been meaning to make this recipe forever and am SO glad I finally did! I threw in some jicama I had that needed to be used up and loved the crunch! I also had to use gluten-free corn bread because one of my guests can’t have gluten (le sigh) – I was worried about how it would hold up in the salad, but it turned out to be a huge hit! I’m hiding the leftovers in the back of my fridge and excitedly anticipating eating it for lunch!